A case led by San Diego attorneys, Kipp Williams and Michael Weitz of Blanchard, Krasner & French, was recently awarded a Top 50 Jury Verdict distinction. Mr. Williams and Mr. Weitz are being recognized for successfully guiding their client’s breach of contract case, Flannery v. MSi Lighting Inc., to a conclusion of approximately $272,500 awarded in damages to the plaintiff. The Plaintiff was also awarded an additional $110,000 in prejudgment interest and $230,000 in attorney’s fees. 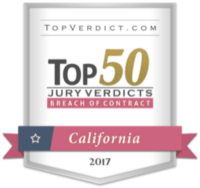 Each year, Top VerdictTM recognized U.S. law firms and attorneys who obtain the highest jury verdicts, settlements, court or arbitration awards in particular regions and areas of law. Blanchard, Krasner & French is proud to have so many passionate, dedicated professionals such as Mr. Williams and Mr. Weitz representing its varied clientele. We are excited to see our team earn such a distinction and eager to continue working on behalf of our wonderful clients.